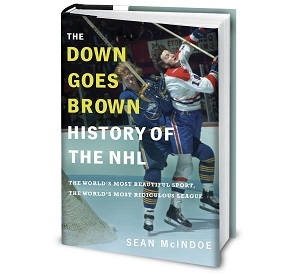 Down Goes Brown: So now what? Now that the pulse has stopped and we're two Flyer mudhole-stompings away from the official funeral, it's time to start thinking of the future. No, not the long-term future. Thanks to Mats "I would do anything for love, but I won't do that" Sundin, we don't have one worth thinking about. Let's focus on the short-term. What should the Maple Leafs do over the next 12 games before they pack up their gear and head out for yet another early vacation? I think it has to be a three-point plan. Here's what you do, and why you do it. I'd call this a no-brainer but that would be interpreted as a shot at Paul Maurice. So let's just say that conventional hockey wisdom is with me on this one. The days of young players getting three or four minutes of icetime a night needs to end, right now. That doesn't mean you bench every veteran and let the kids run the show. But it does mean that you start grooming the youth for the roles they're expected to play next year and beyond. That means that it's time to find out if Tlusty can play on a powerplay unit, whether Stralman can handle 22 minutes a game, and whether guys like Earl and Newbury can keep the energy level up for more than a shift or two per period. Because it's time to figure out whay you've got in these kids. There may be some decent talent here, but I don't think any of the young players in Toronto are sure things. Some will turn into solid NHLers. Some won't. The sooner you start to sort them out, the better. Whoever replaces Cliff Fletcher is going to want to know what these guys can do at the NHL level. Would you want to explain to Brian Burke -- er, I mean the mysterious future GM -- that you don't know who can do what because you were too busy boosting Jason Blake's powerplay time? Not every game, and not even most games. But get Raycroft in there for at least three or four games the rest of the way. As a rule of thumb, start Toskala in games that have a critical impact on the other side's playoff chances, and split up the rest. Ideally Raycroft will play well enough to increase his trade value from "zero" to "marginally above zero". Even if he doesn't, Toskala's groin could probably use some rest. And a third reason that not many people have talked about: Raycroft has earned it. Yes, his play has been awful and I'll be the first in line to dance on his metaphorical grave when he's gone in the offseason, but say this for him: he's handled this situation with class from day one. As a hockey fan in Ottawa, I know that a backup goalie with a sour attitude can destroy the best of teams from the inside out. Raycroft doesn't deserve any cheers for his play this year. But his willingness to take the high road entitles him to at least a round of polite applause, and a handful of chances to showcase whatever NHL skills he may have for his next employer. Once you've taken care of the first two points, you continue to do everything else in your power to win. Expect the players to play hard when they're on the ice. Pull the goalie when you're down late. Fight right up until the final whistle. Not because you owe it to the fans who "pay good money" to see you -- after all, most of the church-mice at the ACC have expensed their tickets long ago. But playing hard sends the right message to the young players. This team has accepted losing with a shrug for too long. That's going to change next year, if Fletcher can be believed, so you might as well start ramping up the intensity now. And besides, playing hard is just the right thing to do. Karma counts for something. Just tank tonight and tomorrow. Then win the rest! I really like the idea of playing the kids now. Most people have written off this team, so it's a thinking kind of like, "Why not? Why risk getting people hurt who aren't young enough to heal quickly *cough Tucker* *Cough cough**?" Sorry, something in my throat back there. You know that old saying "It's not bragging if you can do it"? Well, in the case of the Leafs, "It's not tanking if you can't do it." And they can't beat anyone in a game that means something. Well you won tonight. Good game Leafs. Hopefully Stevens shoots Randy Jones before the next game.